Back before I had kids, I assumed gender identity was largely a construct of socialization. Roo has always been interested in building blocks primarily as a way to make accoutrements for her dolls and stuffed animals but Jasper sees them as a way to create new toys and worlds to play with them in. Ever since he was able to sit up and put two pieces together, the kid has been trying to make things. I'm not sure if its his latent male need to put pegs in holes (seriously!) 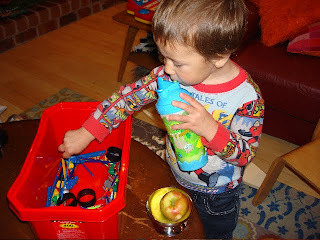 or the familiar creative drive, but Jasper likes to take things apart to see how they work and then put them all together again. I was pretty excited when Team Mom offered to send me some of the season's hottest building toys from K'NEX. We received the 400 Piece Value Tub, which is technically recommended for ages 7 and above because it has such teeny tiny pieces. Jasper has never been much for sticking things in his mouth, though, so we let him play with them under direct supervision. The 400 Piece Value Tub comes with building ideas for 20 different models and a convenient storage tub (bright red- perfect for the holidays!) that will fit many other sets, including other popular brick brands. Jasper loves the nubby tires for creating his own vehicles but, admittedly, his favorite thing to do with the set right now is dump everything out and sort the rods, connectors and bricks by size and color. 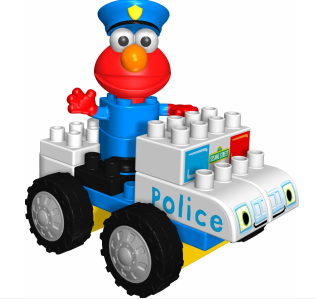 The other set we received was probably more age-appropriate for Jasper: the Neighborhood Collection Police Car Building Set, featuring Elmo as a friendly policeman. K'NEX has a whole range of Sesame Street Building Sets that are perfect for 2-5 year olds. (We actually have the Oscar the Grouch so I am looking forward to playing "Oscar gets hassled by the Man" after the kids go to sleep. Just kidding.) The new Sesame Street Neighborhood Collection Building Sets let children build brownstones and police stations and play with their favorite Sesame Street friends, including Elmo, Cookie Monster, Grover and Ernie. K'NEX has building toys that are sure to please everyone on your holiday list, from preschoolers to adults. (The 6-Foot Ferris Wheel is the largest K'NEX set of all time, featuring 8550 pieces and a plug-in motor!) K'NEXis also helping to spread the holiday spirit by donating 10% of online sales during the heavy shopping months of November and December to the Children’s Hospital of Philadelphia. For more information about their charitable partnership, click here. And now through December 7th, you have the chance to win over $1,000 worth of K'NEX toys and be featured on KNEX.com. 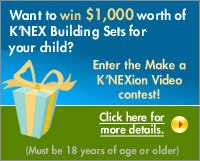 To enter the Make a K'NEXion Video Contest, submit a video showcasing the way you use K'NEX products. The possibilities are endless - just use your imagination! 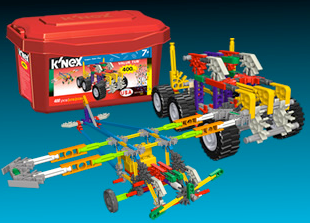 The top ten videos will be featured on KNEX.com and the grand prize winner will receive $1,000 worth of K'NEX toys! Disclosure: We received the two sets shown above from Team Mom in return for writing this review.